There is lots to know about your home. If you value the outdoors like most homeowners, then a Chattanooga exterior painting will do the trick. It will help create a more picturesque atmosphere for everyone to enjoy and put your home back on the map. If your home was being passed up by your neighbors, then exterior paint will definitely leave a mark. Here are a few tips about exterior painting in Chattanooga. Home maintenance projects are always fun, but better when they are done by professionals. Professionals can get the job done right just from their expertise. Exterior painting is not an easy task, but necessary in order to clean up the outside of your home. An exterior is one of the most inexpensive forms of remodeling. If you’ve thought about remodeling your home, but just don’t have the time nor money to do it, then start with something that you can actually afford, exterior painting. If you decide to get a Chattanooga exterior painting make sure that you choose your painting contractor very carefully. You’ll need to locate one that’s close by. Having to travel means that you’ll end up paying for their gas. Save yourself more money by going with one that’s close in proximity. Another thing that you should know is that exterior painting is very challenging. Professional painters know how to perform the task safely. It’s highly recommended that the homeowner does not attempt this on their own as there are lots of potential dangers that present themselves. 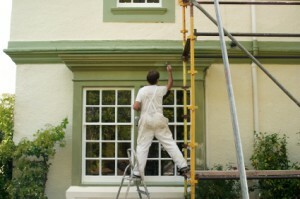 Exterior painting provides safety and preventative maintenance for your home. Consider this, when your children are out playing, you won’t need to worry about them brushing up against your home and getting hurt. You won’t have to worry about future repairs when you have your home painted, as the sun and cold weather won’t be able to penetrate it. Make your exterior last longer with an exterior painting. There is lots to know, but one you do, then the rest is easy. Call to have it done soon and be ready to take on that Tennessee heat this summer. Your home will easily become your haven when you have it looking the way you want. There are lots of things that a Chattanooga exterior painting service can do for your home. If you ever want to sell your home, then this is the best way to put it up on the market. A newly painted home will sell a lot faster than one that isn’t. Don’t keep putting the idea off. Call the Williams Painting Company and you’ll have your dream home. If you are looking for a Chattanooga exterior painting contractor, please call 423-870-3615 or complete our online request form.